The TV Addict: The only thing we’re really prepared to spoil about DEXTER’s seventh season premiere that — in case you haven’t heard, is a return to form for the series — is that Dexter Morgan is in over is head. So just how much trouble is our intrepid anti-hero in? Put it this way: The opening sequence of the seventh season premiere involves him rushing to the airport! Read into that what you will. Well that was dumb. We know he's not fleeing. Yes he is. He's going to Italy for a day and then he's coming back. My insider told me that. Ur insider must be your stomach then it means that ur hungry not dex's fleeing feeling! It's Dexter killing a wheelchair bound man. That's lame. No, he's being stabbed while he's tied to the table with the wheelchair. He wasn't being taken anywhere. Yeah, could be the cop killer from the Russian mob. This is the airport of a large US city post 9/11. Don't you think someone (TSA etc.) would notice someone carrying an ounconscious person through the airport? That's why he uses the wheelchair: "My uncle is fine, he's just sleeping." 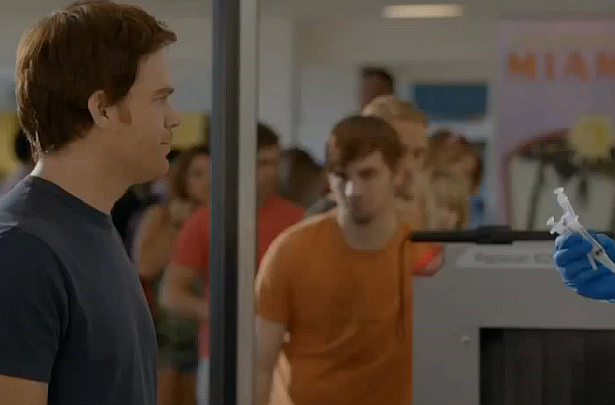 Dex won't flee the country in episode 1, which means there must be another reason why he is at the airport. That picture (which is from the fast-moving sneek peak) shows Dex trying to get some syringes through security. If he was on the run, he would have put them in his checked baggage, where they are allowed. The only logical explanation is that he wants to use them inside the airport. IMO it will start with him speeding towards the airport, then fade to black and '12 hours earlier', and we'll cut to the church right after Deb walks in. Otherwise, I am a decent girl and will not say what I think about this idea :-))) We saw the 2 minutes, eh? @2:47 THANK YOU! I don't know how anyone can watch this show for 7 years and not immediately figure out what the wheelchair was for. As soon as I saw the screen caps a few weeks back from that really fast teaser, I knew exactly what he was up to and why he had the wheelchair. On top of that, he's probably taking out a janitor since he's going into a bathroom that's in the process of being cleaned. The janitors always wait until everyone is out in order to keep people from slipping, or from taking up a needed stall. Dexter isn't dumb enough to needle someone with a bunch of people in the bathroom. So, the bathroom is being cleaned, and whoever is in there is alone with Dex. A janitor is the only logical conclusion. If I'm wrong about the janitor, then I guess we're going to see another dumb loose end that never gets addressed. Something similar to the stupidity of using Trish's phone to text Joe Walker in S6. As for flashbacks, this isn't Breaking Bad, people. Dexter has only used flashbacks to make a point. Even then it went all the way back to childhood, not just a few hours or days. Personally, I like the feeling of moving forward with the show rather than being shown what's going to happen and then seeing the events that lead to the ending that you ALREADY KNOW is coming. It pretty much destroys any tension. Breaking Bad does do it very well, but they've done it since day 1. For Dexter it seems way out of place. Dexter is going to the airport. It will say something like 2 weeks earlier and the airport scene will be explained in the season finale. The season finale will be called Lethal Injection, so it is a good idea he is running out of the country. This is not Breaking bad. And the last episode will not be called "Lethal Injection". Are you the same person who says this every year? Cept last year, what was it, oh yea, "electric chair"
You do not know what the season finale will be called. And I am not making this up. I was reading from a reliable source. Maybe the Lethal Injection title is just a first draft title. Writers change the titles of episodes. Like the Season 5 finale was going to be called 'Through a Glass, Darkly' and they changed it to the Big One for some reason, Through a Glass Darkly is a good title. P.S. I don't know where Breaking Bad fits into this. I am not that person. I discovered this blog after the season 6 finale... but I did read that the season 6 finale will be called Electric Chair. I am 6:18 again. Also, didn't they release the first 2 minutes of Dexter Season 7 Premiere? Then what is this?! P.S. I also read that the Season 7 Premiere would have been called Doakes Returns. Weird title.